Superchunk is an indie rock band that formed in 1989 in Chapel Hill, North Carolina. 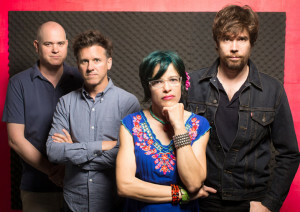 The band consists of frontman Mac McCaughan, guitarist Jim Wilbur, bassist Laura Ballance, and drummer Jon Wurster. Formed around the same time McCaughan and Ballance started the indie rock label Merge Records, the band helped shape the Chapel Hill music scene with the likes of Polvo and Archers Of Loaf in the early nineties. The scene had already had the indie world’s attention just a few short years earlier when Flat Duo Jets and The Connells emerged. The D.I.Y. quartet originally started making music under the moniker Chunk. The band’s name was chosen when original drummer Chuck Garrison’s name was misspelled in the phonebook. Kids, Google “phonebook.” They later added Super, to avoid any potential issues with the New York jazz band by the same name. Over the course of an on-again off-again 25 year career, the Heritage Act has released a grand total of ten studio albums. Two have come in the last five years, since reappearing after a ten year break from 2001 to 2010. Their latest release I Hate Music dropped last August. McCaughan fronts the indie band Portastatic. He founded the side project back in the early nineties, the band is still together and have released six compact discs. In his free time, Jon Wurster plays drums for Bob Mould. The fine folks at Merge Records recently announced their 25th Anniversary Music Festival. The Merge 25 will feature the likes of Superchunk, Neutral Milk Hotel, Bob Mould, The Mountain Goats, The Love Language, and Wye Oak. The festival will be held in Carrboro, North Carolina at the Cat’s Cradle July 23-26.